This morning Apple announced the iPhone 6S and the iPhone 6S Plus at their September Special Event Keynote. Despite it being just an "S" year, the new iPhone lineup was packed with interesting new features and improvements. The marquee feature of the new devices was a new technology that Apple has named "3D Touch." 3D Touch is the newest member of the family of force sensitive technologies that Apple has been spreading through all of its product lines throughout 2015. The Apple Watch has Force Touch, the MacBook lines have Force Click, and the Apple Pen has its own brand of force recognition geared towards drawing and illustrating when working with the new iPad Pro. 3D Touch, however, is by far the most immersive implementation so far. 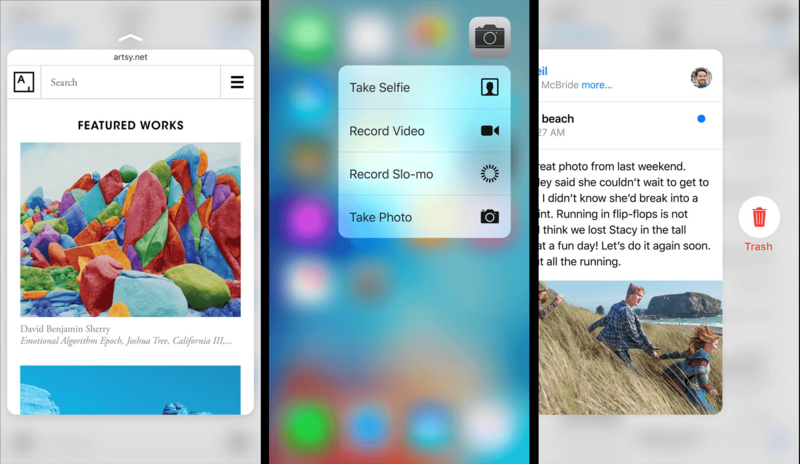 3D Touch has been deeply integrated into the software of iOS 9 on the iPhones 6S. Essentially, it is a new interaction paradigm, allowing users to move "in" as well as the standard left, right, up, and down that have always been a part of multi-touch on iOS. This new dimension of interaction's deep integration into the system is what gives it the name "3D Touch." 3D Touch creates a number of new and interesting ways to interact with iOS, which most of Apple's applications already support. Two of the main additions are the new "Peek" and "Pop" gestures. Push in lightly on something like an email message to "Peek" at it, bringing up a snapshot view from which you can read the first part of the message (between one-half and three-fourths of the screen is taken up by the Peek, and in that space it displays as much content as will fit). If it's something you want to interact with right away, push in harder to "Pop" the message into the full screen view. If you don't want to bring it to full screen, just let go and it will shrink back into the list view, dismissing the Peek after you simply lifted your finger. In some apps, you can even swipe the Peek left or right to reveal options specific to the Peeked content, such as deleting a message or marking it Read/Unread. This type of interaction now exists all over the system. You can Peek at website URLs to see a view of the webpages they lead to, Peek at the thumbnails of the photos you just took to see if you need to retake them before leaving the Camera app, Peek at addresses to see their general area in a map... you get the idea. The most powerful aspect of Peeking and Popping is that you can preview content from different apps without leaving the one you are in. Take the Safari URL example I mentioned above. You can Peek at a URL in Messages (or another application) to see what the webpage is. If you let go of that Peek, you are still in Messages because you never left. If you decide to Pop it, you are no longer in Messages, you are now in Safari. The seamlessness of the transition is amazing. What began with iOS 9's new app switching features has now been doubled down on with Peeking and Popping: that the once well-defined lines delineating individual apps are now blurred and much less obvious, even less important. There are a few more cool features being enabled through 3D Touch as well. Quick Actions allow you to push in on app icons on your home screen to access a menu of actions from within the app that you can trigger right away. Some examples Apple showed were pushing on the Maps icon to automatically launch directions back to your home, pushing on the Messages icon to immediately jump to texting a certain contact, and pushing on the Camera icon to immediately jump to taking a selfie with the FaceTime HD camera. A feature that was pulled out of an early iOS 9 iPhone beta is now back in the guise of a 3D Touch gesture: on the iPhone 6S and 6S Plus you will be able to push lightly on the keyboard to turn it into a trackpad, dragging the cursor around to reposition it where you want your input to be next (this feature still does exist on iPad as a two finger tap-and-slide gesture on the keyboard). A new multitasking gesture allows you to push in on the very edge of the display and then drag (as if performing the standard back gesture, except while pushing down lightly) to switch back to the last used app. This pretty much works as an iPhone version of the four finger swipe multitasking gesture that has existed on iPad for years. Finally, while no Apple Pencil support has been announced for the iPhone 6S or 6S Plus, you can use 3D Touch to do force-sensitive drawing on the iPhone's display, if using an app that has implemented such a feature. For any developers that might be curious, Apple is releasing new developer APIs and classes for almost all of these 3D Touch interaction models, so third-party applications will be able to take full advantage of them to add new and interesting features. The only thing that third-party developers will need to be wary of, is that only iPhone 6S and 6S Plus users will have access to these gestures. As such, developers should (and probably wouldn't pass review if they didn't) only use 3D Touch to make their apps better in ways that aren't critical to the basic use of the app. 3D touch gestures can create shortcuts and make for improved experiences in navigation and interaction, but should never be the only way to access any functionalities, at least not until years down the road from today. Not surprisingly, the iPhone 6S and 6S Plus have each received some great new upgrades under the hood as well. Apple's new A9 chip boosts performance and efficiency, bumping the CPU up to 70% faster than the previous A8 chip, and the GPU a full 90% faster than the A8. The M9 motion coprocessor has now been integrated into the A9 chip, and can now measure running and walking pace as well as steps, distance, and elevation changes. Due to improvements in M9 chip, Apple is now able to make Siri be always on and listening for the "Hey Siri" command. Previously this was only true when your iPhone was plugged into power, or when the display was on and the Siri window was actually open on it. The new iPhones also include an improved Touch ID sensor. According to Apple, Touch ID can now register your fingerprint a full two times faster than the previous version. Finally, the new lineup has significantly improved LTE and Wi-Fi speeds. Up to 23 LTE bands are now supported, and support for LTE Advanced means it can download over LTE at up to 300 Mbps. Improved Wi-Fi can now handle speeds of up to 866 Mbps. Apple's new iPhone lineup is now being built using 7000 series aluminum, a new alloy that is far stronger than that which previous iPhones have been made from. Hopefully this means that round 2 of bend-gate can be avoided this year. The glass screens of the new iPhones are made from a new dual ion-exchange process, which purportedly makes the glass stronger at the molecular level. Apple claims it to be the most durable glass in the entire smartphone industry. Finally, the iPhone 6S and 6S Plus will both come in a new Rose Gold finish, which is much more pink than the Rose Gold Apple Watch. While it's not for me, the finish does look nice, and fits in well with the other colors in the lineup. Also interestingly, the Gold color option has been removed from the iPhone 6 and 6 Plus lines (which are now both being sold in the lower pricing tiers typical for last years models). This means that anyone who wants a Gold or a Rose Gold iPhone will have to pick from the new iPhone models. 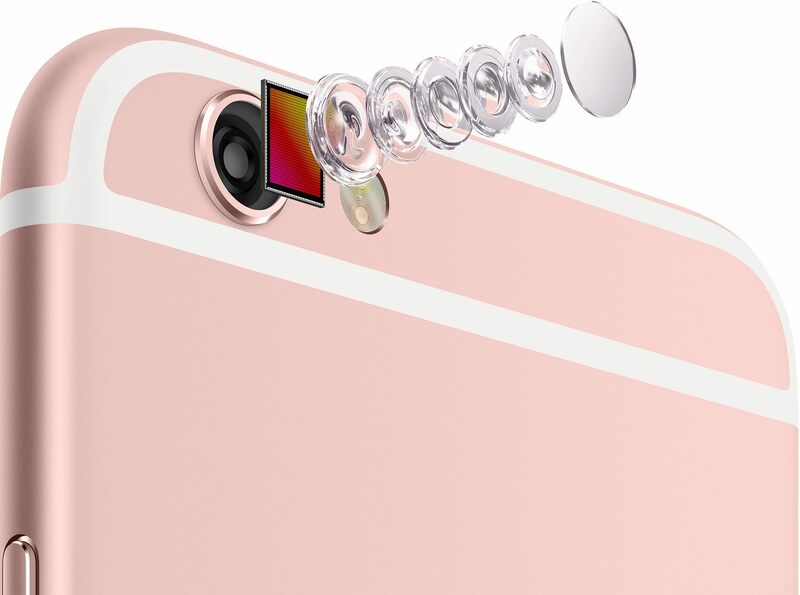 The iPhone 6S and 6S Plus both feature hugely upgraded 12 MP iSight cameras (that's the back one). The sensors inside have been upgraded with 50% more Focus Pixels, a new image signal processor, improved local tone mapping, and more. Furthermore, the iSight camera is now capable of shooting 4K video, although if you plan on doing that very often (it can be turned on an off from the Camera app) you should probably make sure to purchase a model with more than 16 GB of storage. The front-facing FaceTime HD cameras on each device have also been upgraded to 5 MP. Coupled with this, Apple had implemented their True Tone flash technology into a new "Retina Flash" for the front camera. This idea, which is basically to light up the entire screen of the phone to produce light on the faces of in front of the camera, has been around for a while as a feature available when taking pictures with the front-facing camera in Snapchat. Apple's implementation, however, is much more impressive. In fact, they built an entire custom chip into the new devices, the sole purpose of which is to light up the display three times brighter than its max brightness when setting off the Retina Flash. The True Tone flash was first released as the flash for the iSight camera in iPhone 5S. The camera is able to measure how much warm and cool light needs to be outputted in order to keep the colors in the picture natural, and the True Tone flash then flashes these colors, rather than just flashing pure white light. The Retina Flash uses the same concept, but flashes the colors on the screen instead of with an actual flash. The last big new feature in regard to the camera on the iPhone 6S and 6S Plus is Live Photos. This is a very intriguing addition in which pictures taken by the camera will actually take a series of shots before and after the one that is displayed. You can then push firmly on the photo when viewing it and it will transform into a Live Photo, showing a few seconds of the scene moving as it was when you too the shot. These Live Photos have sound as well, although Apple assured us at the Keynote that these are not videos, but an actual series of full quality photos. Basically, they are GIFs, but definitely a very cool new take on GIFs. Particularly when you realize that Live Photos are on by default, and are taken every time you take a standard picture with the camera. That means that, in theory, you never have to think about taking Live Photos or do anything special to get them, you just continue using you iPhone like you always have, but now you'll be able to tap and hold on any of your photos to get a little more a view of the moment in which they were taken. Live Photos can be viewed not only from the Photos app, but basically system wide (at least among Apple's apps) wherever you can look at photos. That includes in Mail, Messages, and Notes. You'll even be able to watch Live Photos from any of your devices that have access to your iCloud Photo Library. Finally, what I think is one of the coolest features with Live Photos, is that you can set a Live Photo as your lock screen background. Then you can push firmly on your lock screen at any time to see the background come to life and move around a little bit. Along with the new iPhones, Apple also announced new iPhone accessories. New Lightning Docks, available today for $49.00, come in the same four colors of aluminum finishes as the iPhone 6S lineup, and feature an audio port to play audio from your iPhone through headphones or speakers while it is charging. 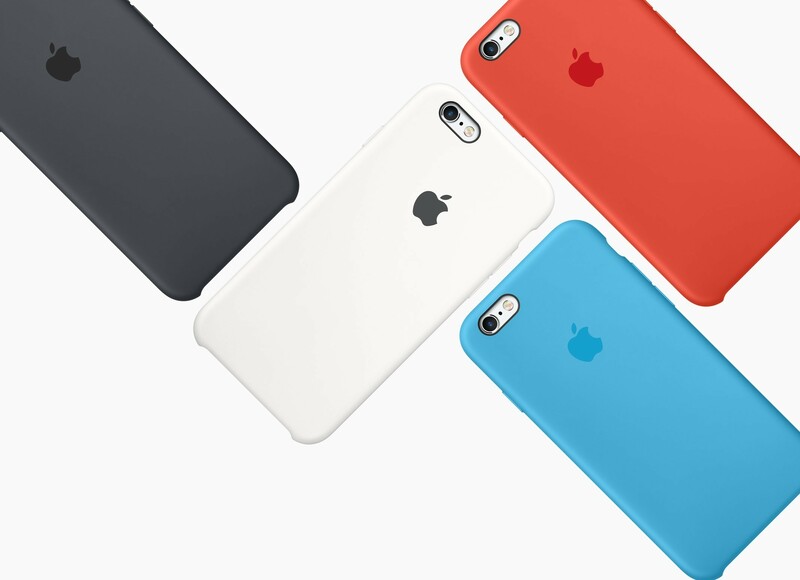 For cases, Apple's leather case lineup has Midnight Blue, Saddle Brown, Rose Gray, Brown, and Black. Their Silicon cases come in even more colors, too many to list here (you can find all of them here if you're interested). Finally, pricing. It's no big surprise that you'll be able to get an iPhone 6S on-contract starting at $199, and a 6S Plus starting at $299. However, it gets much more interesting when you take a look at the new payment plan option that Apple also revealed. It's no secret that over the last couple years, the phone carriers have been trying to push customers away from purchasing phones on subsidized contracts. If these contracts ever disappeared entirely, Apple might have been left having to advertise their phones at their real, off-contract, price points. These in the past (and current) lineups have started at $649 for whatever the year's newest models are, and that is a much ugly number to look at than $199 for the average consumer. With todays announcement of the "iPhone Upgrade Program," Apple is taking steps to avoid ever ending up in that situation. Instead of only being able to buy phones off-contract at their full multi-hundred dollar prices, you can now enter into a monthly payment plan to pay off your phones over 24 month periods. Furthermore, at every 12-month interval, you can choose to turn your phone back in and get a newer model for free, you'll just continue your payment plan for another year further. This is the same strategy that most of the major phone carriers are switching over to as well, but now Apple will be getting the money directly from consumers for those who participate in the payment plan. A lot of people don't like the idea of plans like these because they lock you in using devices that you don't own, and force you to trade those devices back in every year. If you just bought the phones straight up, you could sell your old model the next year and end up paying much less. That's definitely true, but a payment plan is also much less inconvenient than having to sell a phone every year, and I personally would much rather be locked into a payment plan with Apple than one with AT&T. Contracts still exist (for now), so no one is being forced to this plan yet. It's also important to note that, unfortunately, the upgrade plan is currently only available in the U.S. That said, since Apple itself controls the plan, they'll hopefully be able to spread it to more countries fairly quickly if it is successful in the U.S. For those of us who are in the States, it's definitely an interesting new option to get unlocked iPhones without putting down the full $650+ that you would otherwise need to. The iPhone 6S will be available starting at $32.45/month with an annual upgrade. The iPhone 6S Plus will be available starting at $37.45/month with an annual upgrade. Outside the U.S., the starting prices should largely remain the same as they were for last year's lineup 1. The iPhone 6 and 6 Plus have moved down to lower tiers, each $100 cheaper (making them, in the U.S. at least, $99 and $199, respectively), and the iPhone 5S now sits at the bottom of the lineup as free with contract. The iPhone 6S and the iPhone 6S Plus will both ship to the public on September 25, with preorders beginning two weeks earlier, at 12:01 a.m. PDT on September 12.